Update!! 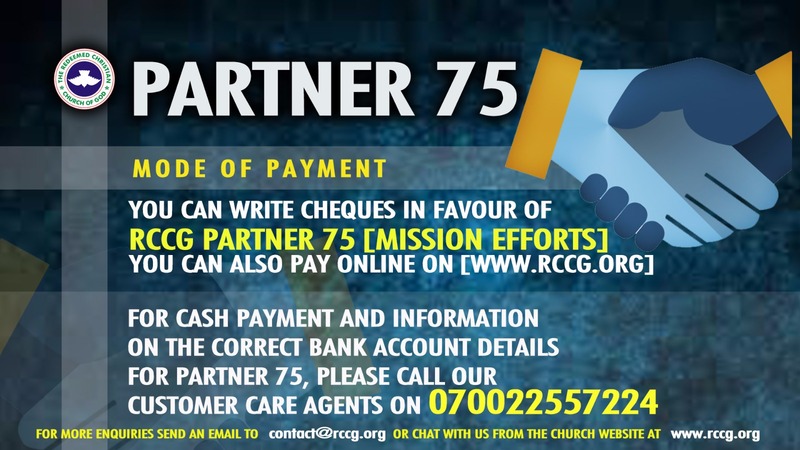 The RCCG would like to inform anyone who intends to be a member of the “Partners 75” that the online payment platform is now live. We thank you for your patience. God Bless you! Registration is to enable you get your ONLINE PARTNER75’S CODE starting with “RCCGP75” for example RCCGP7510324 & this code will be sent to your email and to your mobile phone as text. When next you want to make your payment you don’t need to register again just go to www.rccg.org then click on PARTNER75 LOGIN Link here, to sign in. You will be required to enter your membership code and your mobile phone number as password and the system will bring you to your membership page where you can then make payment ONLINE. You can click on HISTORICAL PAYMENT DETAILS to see all the contributions you have made from the day partner75 programme started till date. Kindly be reminded for those who want to pay cash, you have to register first, and then obtain your PARTNER75 code. You will then take this code to any branch of Zenith Bank and pay cash. Please note that you must go there with your PARTNER75 CODE for the payment to appear under your name. The Partners 75 are those who are willing to sacrifice 75 of what they have to support the missionary work of the Church. For you to be a member of the Partners 75, you may join any of the following groups. General: Pray for Pastor E.A Adeboye for 75 minutes or more every month. This roughly equates to about two and a half minutes a day. You can donate any amount higher than those in any of the previous Groups monthly. If you are writing a Cheque, kindly address it to “Redeemed Christian Church of God” and write ” Missions Effort” at the back of the Cheque. Please, i am new, i want to register, but the site is not opening, what do i do? maybe the network is bad. can i help you out with the registration. you can contact me on 08131816254. i mean no harm. Online donation is not working.What happen? Bless be God who has kept us till now. I have been paying for my donation of #750:00/month and I have paid till December 2017 since March. Am surprised that no payment has been recorded for me. I did not know that I even have to log in, and also did not know I have to upload proof of payments, and I have always made transfer with my phone. When I logged in this I was surprised to see zero payment. Can records of bank alerts be look into and my payments updated please. Thanks and Good bless us in JESUS NAME. There is a serious issue with your online Partner75 platform. It fails to convert to the equivalent of dollar plus, payment remains impossible. Please, can you rectify this? Thank God for this opportunity, I was able to make payment this morning and code received using the online platform. Hello! The GTB transactions I made today were 3 in number, one of which I did not bother to confirm because I got a bank alert. However, I have only been acknowledged for 2 transactions by email and on my payment history page. The balance stated therein is incorrect as evidenced by my bank alerts. I would sincerely appreciate it if this error is rectified. Thank you. acc name;; Gideon Douglas Udoh. I joined the convenant partners online in June 2018 for convince sake, l given an lD number but since d beginning of July,2018, l have not been able to login with the ID to pay for July. Please what can l do to pay? Please i cant acess my phone again so i have no way to retrieve my partner code number can you please help me. Good day my name is Mr. Ariyo Samson Oluwatimehin am a member of Partner 75 I have been unable to log into my account because I don’t have my RCCG code. It was sent as a text message to my phone but currently the phone is no longer working. Please can you help me retrieve it and send it to my mail. I been having Di in registering, l have tried it severally but am still getting the same error feedback, l have been a partner since February but has not registered, please l need assistance. I wish to register on the partner 75 platform, but i can’t register. Please l wish to receive my code via SMS, l received a message that said it was sent to my email but for weeks now I have not received the message. Good day, I just registered in few minutes a go. But I have already paid the last year with TEAM NEHEMIAH. please What next now? My name is Sodeinde Olutosin I have been trying to register for 3 months without any success. I have been transfering the money to UBA account no 1006803688. Please what do I do? I am yet to get my login details please. I made a cumulative 3-month payment (for Oct, Nov & Dec 2018) on 23-Nov-18 and my account was duly debited. However my transaction page on RCCGP75 still indicates that the transaction was unsuccessful… till date! I just made my January 2019 payment today and it was however successful. Please check and reconcile the 23-Nov-18 payment. Also, work on making the payment portal more Robust & effective, including the security features (sometimes the payment portal tells me the information I’m transmitting is not secure). I have been trying to make payments from the USA without any success. The portal is not working for international transactions, please help look into this. GTB is not responsive at all, Zenith and Stanbic kept giving error messages. Please am having problem to make the payment here. I was unable to make payment on my 75partner portal. Please If you can help me look into it. Please look into my 75 partners porter to make payment. I am totally surprised that there’s no listing of my country NAMIBIA amongst the list of countries in the drop down section of the Partner75 e-registration form. Please could you kindly rectify. Please look into my account, I have been trying to make a payment online since 2017 but its just not working.